BEESWAX in cold process soap making can be challenging at times; you have to be prepared to work fast and act quickly when working with beeswax. Experience really pays off when it comes to unexpected incident during the soap making process when experimenting with new ingredients or recipes! 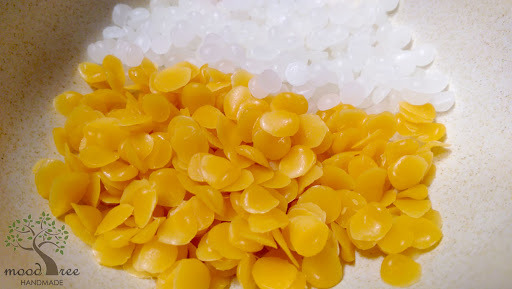 Picture: White beeswax pellets and yellow beeswax pellets used in my handmade body & bath recipes. Beeswax is a natural wax produced by honey bees. I got my hands on some beeswax and immediately made the first batch of the Cocoa and Milk Soap. I planned a recipe and researched a lot about Beeswax’s behaviour in cold processed soap long before I actually ordered the beeswax! But alas, the beeswax was behaving and I ended up with “family soaps” (btw, my family soaps are great soaps that just don’t “look” great, in case my sisters are reading this!). 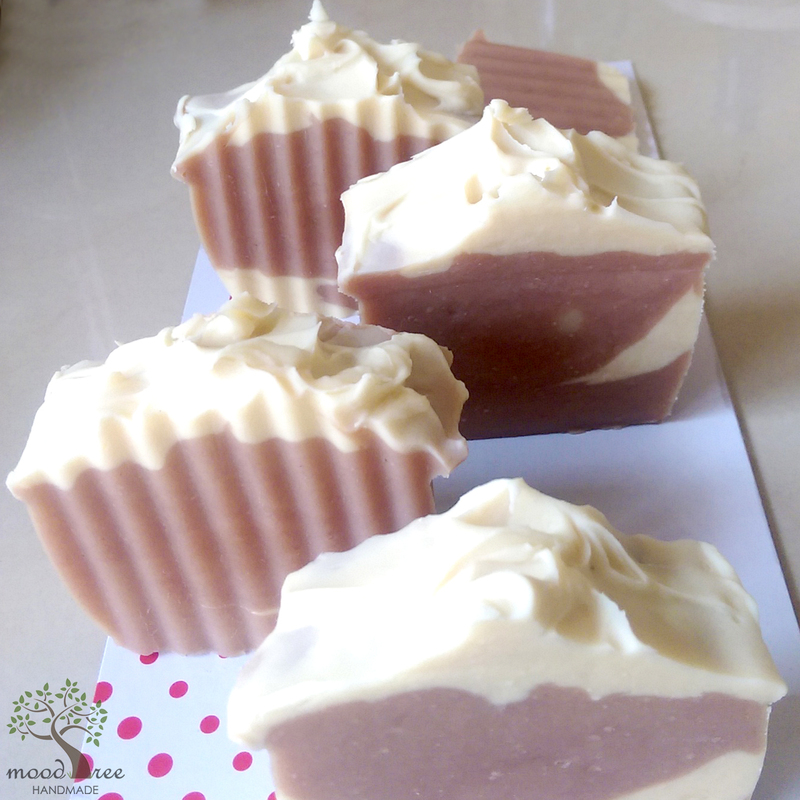 For this Cocoa Milk Soap, I used white beeswax. After trying yellow beeswax in other cold process soap recipes, I come to prefer yellow than white beeswax. The beeswax was melted with the other oils used in the recipe but I did not cool (only down to about 70 degree Celsius). I learned that I'll have to really be patient and let them cool to room temperature – that's the first lesson learned when working with Beeswax and high sugar soap recipes (such as milk and honey). The oil mixture and lye solution were mixed at about 70 degree Celsius but the temperature hiked once the lye solution was added to the oil mixture! This soap batter became kinda hot and started to “rice” after only seconds of stick-blending that I was so worried it would seize on me (it didn't though). At first I suspected the beeswax behaving but then I guessed the culprit is the temperature. I even forgot to add essential oils intended for this recipe as I need to work quickly and mold the soap batter before it hardens. But I wonder why I remembered to split the batter to 2 parts; added cocoa powder to one part and titanium dioxide to the other. We tend to remember what the eyes can see but forgot what they can’t see at the time. So now I always put essential oil bottles in the mold so I would know if I missed them before molding. That’s the second lesson learned. Once molded, the soap was placed in the freezer. Only after minutes, I can see the silicone loaf mold was already “releasing” the soap! I noticed that when I repositioned the mold. To prevent gel stage however, I kept it in the freezer overnight. Then the soap was taken out, defrosted, unmolded and cut. Picture: Cocoa Milk Soap - see the ring in the middle (partial gel), the white spots (beeswax) and air bubble holes? If you look closely in the attached picture, you will see partial gel in the middle of the soap (the gel ring is clearly visible) despite the fact that the soap was put into the freezer within seconds after the thick soap batter was plopped into a silicone loaf mold. Furthermore, despite the high temperature when making the soap, there are white “rice” spots everywhere suspected being the solidified beeswax. Some of the spots are no-kiddingly large to my annoyance. Beeswax melts at high temperature and solidifies quickly at room temperature so I’m not sure why this happened. When testing the beeswax with lip balm, the beeswax did not solidify when the beeswax:liquid oil ratio is 2:8. 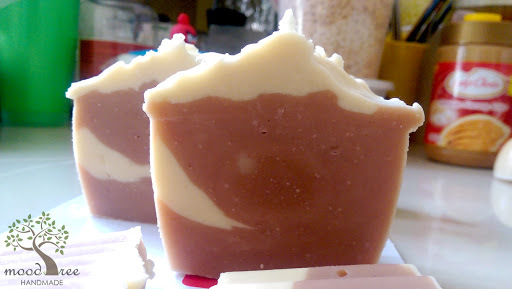 In this soap recipe, there was only 3% of beeswax (and btw, except Shea butter, all other hard oils in this soap recipe are always in liquid stage in my soap studio (aka my kitchen :P) with room temperature about 29 degree Celsius at most times). The third lesson I learned when working with beeswax in this soap recipe is, always start with manual hand-mixing before stick-blending. When stick-blending, just blend by pulsing. My stick-blender is rather powerful I'd say. Yeah, you should get one blender like that if you’re a frequent soaper! The fourth lesson learned is, use a crinkle cutter to cut your soap to cover the "blemishes" on your soap. Due to molding when the soap batter was rather thick, I get a lot of air bubbles despite the fact that I banged the table top to the bottom (well, that’s exaggerative)! I never used rubbing alcohol in any of my soap recipes so I’m kinda good with “hiding” the air bubble holes. 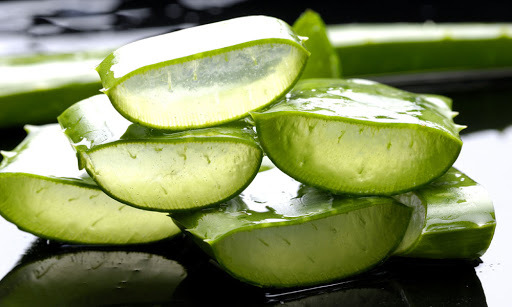 The bubble holes and uneven spots became less obvious when the soap is cut wavy instead of straight. Large bubble holes can’t be hide though, let them be, it’s a handmade soap so I kinda love the holey-look on the soap (sometimes). I don’t mind the look of this soap (it is quite okay) and I love the cocoa and beeswax scent that made through the saponification and curing process. It has been months now, I kept a bar in my collection and it still smells great. Come to think of it, I don’t mind forgetting the essential oils now. The sixth lesson: always make a test batch when testing new ingredients or new recipes in your soap. If something went wrong with the soap, you'd rather throwing away a 1 pound batch than a 20 pound batch! I have both yellow and white beeswax pellets. After using the beeswax pellets for my DIY products, I came to like yellow beeswax for soapmaking and white beeswax for lipbalm. There are also beeswax sold in bars (have to grate it up for easy melting without burning the wax though). Both types of beeswax are good for making candles. For those who are in Malaysia and Singapore who would like to purchase beeswax in Malaysia and Singapore, feel free to contact us. 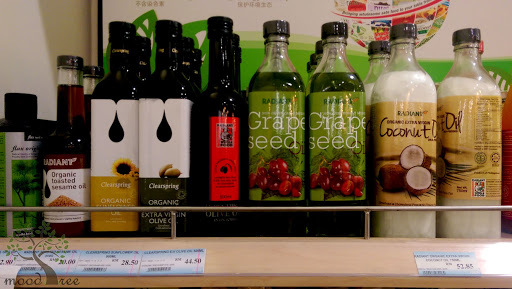 Where to Buy Soap Making Oils in Malaysia?